While the Stem Cell Interest group of MPNforum met on Facebook another, more violent, conversation was taking place just below the awareness of participants. A biological version of “Who goes there?” was underway as sentries mounted in guard towers on every nucleated human cell challenged bits of material washing up in a sea of cytoplasm: Bacteria, viruses, biomatter, all continually sampled. Once a foreign molecule is discovered it is trapped in the jaws of the cell’s guard towers, raised to the surface and waved high, signalling the passing Great White patrol of killer cells and leukocytes. The resulting cytokine alarms release reinforcements as necessary to neutralize or destroy the intruder. These are dispatches from the front lines of the immune system. Life is too fragile and too tenacious. The first law of the immune system. Thou shall not tolerate the Other. Take, for example, the Stink Bug. 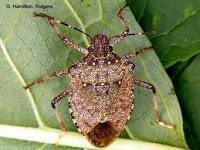 Introduced into Pennsylvania from Asia not much more than a decade ago, the Stink Bug has become a serious agricultural and domestic problem along the Eastern Seaboard. I had a few minor encounters with this little beast that looks a lot like a flake of brown leaf. It got serious when suddenly I found one of these creatures on the cover of a book I was reaching for near my keyboard. Yuck! My response was reflexive. Scoop and destroy. Later I would end up caulking, sweeping, sealing possible entry points…but my first action was to identify and kill. Nothing could be less Me than It. It was an event that helped clarify my thinking about a basic stem cell transplant concern. I had it all wrong, thinking GVHD was a result of our body rejecting the newly introduced “foreign” stem cells. (That’s Host versus Graft.) It’s actually the other way around. Consider the Stink Bug as a cell introduced into a new host environment and your faithful Editor at his keyboard standing in as a Killer T cell. One on one, an easy identify and squash. But if there were a million of these Stink Bugs — think “The Birds” — and a severely weakened host, the result: GVHD. The idea of finding a close match between host and donor is to reduce the chances of GVHD — or make symptoms less serious. In other words, to make the environment appear less like foreign territory to the new cells, less like the Other and more like its Self. Since our own immune system needs to be shut down as far as possible with radiation and/or drugs to assist the engrafting process, we become easy prey for the virile, healthy new stem cells which then often attack surrounding tissues despite pharmaceutical efforts to weaken their impact. That’s why the chance of mild-to-severe GVHD resulting from transplant among unrelated donors is 60-80%. Fortunately, many cases of acute or chronic GVHD can be successfully treated. The Other, the anti-genome, is anything not Me, anything without my identifying cellular footprint. Anything that looks suspicious is the antigen. An antigen can be deadly or harmless or something as necessary as a healthy donated stem cell seeking its footing in a new organism. Or flip it around. As donated cells are being fruitful and multiplying they discover unfamiliar cells in their new environment, the enemy. In that case, We are the antigen. Stem cell transplant is a complex, fast developing specialty. To help patients to a new life free of blood cancer, these masters of hematology basically attack the marrow to replace the old blood-producing stem cells and neutralize the body’s immune system to permit healthy new stem cells settle down and start producing. Since a good part of our immune system rises from the same hematopoietic stem cell we’re trying to replace we have the option to attack the problem at its source and carpet bomb our blood producing system with chemicals and radiation. It’s a process however that has to be finely calibrated between effectiveness and toxicity. And there is no guarantee the target stem cells will be sufficiently reduced or eliminated. There are dormant hematopoietic stem cells living in deep niches within the most oxygen-poor (hypoxic) bone capsule environments. These diehard cells, normally quiescent, have the highest self-renewal potential of all HSCs. They’re kept in reserve and activated by bone marrow stress, like chemotherapy. Miss them and the stage is set for graft failure. And then there’s the ultimate gatekeeper, a kind of early warning system/guard tower poking up from the surface of our hundreds of billions of cells. Except for red blood cells, which don’t normally have a nucleus, every cell in every vertebrate body has that system in place. The purpose of these xenophobic sensors is to keep every possible foreigner off native soil. 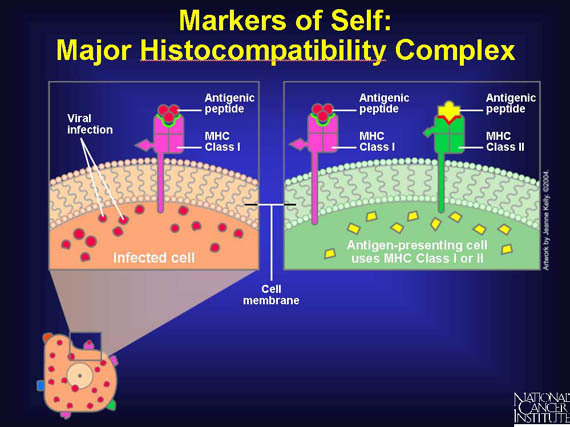 Those guard towers are part of the MHCs, Major Histocompatibility Complex. 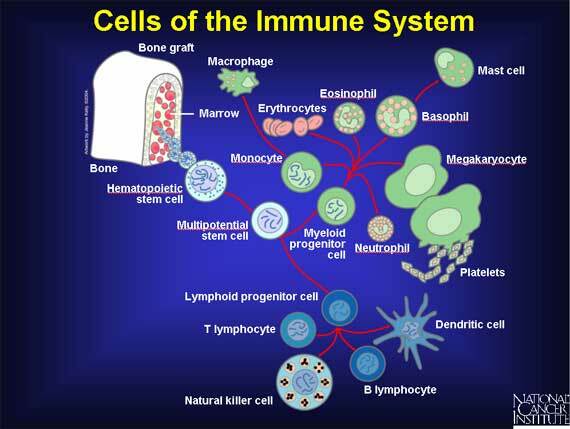 The MHC is a group of genes designed to support the immune system. (In humans the MHC is called Human Leukocyte Antigen, or HLA) Over 100 of these MHC genes occupy a densely populated strip of DNA on chromosome six. Since each has thousands of variations to combine, we inherit a nearly infinitely variable MHC signature… and sport several in each cell with various functions. Some of these MHCs sound the alarm, some attach to abnormal material and wave the offending peptide at the cell surface to attract killer T cells. 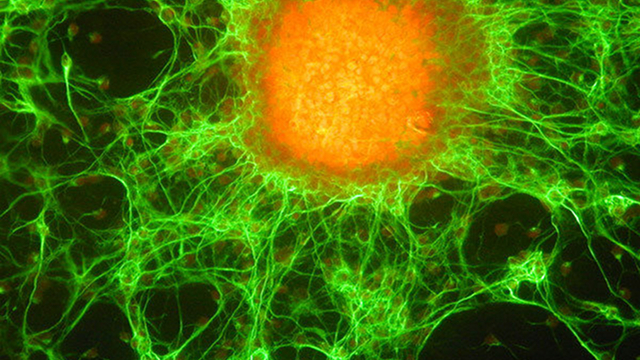 And some MHCs produce infinitesimally small and distinctive filaments on the surface of each cell. Based on the unique combination of MHC genes each cell displays a distinctive signature, filaments of different colors and shapes. It’s the flag that flies over the Self recognized as friend or foe by billions of passing cells. The Self is ever alert to everything Not I. The anti-genome — the antigen — whether a virus, bacteria or stem cell flying the wrong flag is the enemy. Or even a Stink Bug. Identify it. Neutralize it. SCT starts by locating a stem cell match, the closer the better. And then the elaborate biological battle to neutralize the immune system of the Host and modify the immune response of the graft cells begins. There may be no biological tolerance of the Other but there is a cooperative detente that can be reached as a whole new hematopoietic system settles into its new host, each recognizing each other as its Self. SCT often succeeds. Proof enough is the MPNforum SCT interest group conversation taking place on Facebook, far above the circulating, jostling cellular traffic within. ©Zhenya Senyak and MPNforum.com, 2013. Unauthorized use and/or duplication of this material without express and written permission from this blog’s author and/or owner is strictly prohibited. Excerpts and links may be used, provided that full and clear credit is given to Zhenya Senyak and MPNforum.com with appropriate and specific direction to the original content. I knew it was straightforward! :-) Thanks Zhen. I learned a bit of new information from your article. Thank you!